What is AB Testing and how is it used? Simply put AB Testing is the process of comparing user behavior between two versions of a web page or specific page element that share a similar function and a similar user audience in order to determine which performs better for a specific goal metric. All monetized websites share a common goal of converting casual website visitors into engaged users that generate revenue – this is referred to as conversion rate. AB testing is an invaluable strategy that can be implemented to optimize the design, user experience, and functionality of a website in order to maximize its revenue generating potential. AB testing often called split testing allows you to make the most out of your existing user traffic. 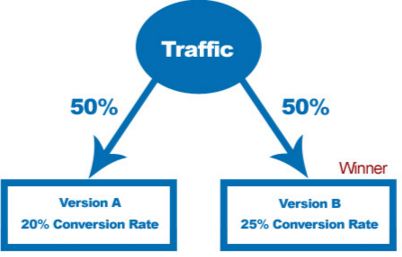 The cost of obtaining paid traffic can often be high; however the cost of increasing the conversion rate of that traffic can often be minimal by merely improving the experience for the user via AB testing. Testing and comparing what may seem like small insignificant changes to website landing pages, call to actions, or lead capture pages can often lead to significant increases in sales, generated leads, and ultimately revenue. Any element on your website can be AB tested. Cloaking – showing one set of content to humans, and a different set to the Googlebot crawler – is against Google Webmaster Guidelines, whether you’re running a test or not. Make sure that you’re not determining when to serve the test, or which content variant to serve, based on the user-agent string. An example would be always serving the original version when you see the user-agent “Googlebot.” Remember that infringing Google Guidelines can potentially get a site demoted or removed from Google search results – probably not a desired outcome of your testing efforts. The time required for a test to be considered reliable will vary depending on several factors like conversion rate, and how much traffic your website gets; an effective testing tool should tell you when you’ve gathered enough data to draw a confident and reliable conclusion. Once you’ve concluded the test, you should update the website with the higher converting variation and remove all elements of the test as soon as possible including any alternate URLs, testing scripts, markup, etc. Do your research: Get an understanding of your website visitors behavior using data tracking tools such as Google Analytics identifying areas for improvement. Determine how many visitors will be needed for the test to be considered “Statistically Significant”: This number could be as few as possibly 100 or in the thousands depending on your goals and typical amount of user traffic. Test your hypothesis: Create an AB test in which one variation has a primary Call to Action with different text and test it against the original to track the difference in user conversion after sending 50% of the traffic to version A and 50% to version B.
Analyze data and draw conclusions: If the Call to Action with the updated text increases clicks, then you can conclude that increased number is due to the change in text assuming all other factors have remained constant. If there is no measurable difference in clicks, then go back and construct a new testable variation with different text or construct a new hypothesis regarding another page element that could be tested. Document each test and report your results to all interested parties. Regularly provide test results and conclusions write ups to Marketing Teams, IT Development, Content Teams, and UI UX. Tie any increase in conversion rates back to potential for increasing revenue and include this data in your write-ups. Ask for feedback for new test ideas to implement. You will be surprised how quickly the entire company will start to invest in an AB testing strategy when they get to play an active role in test ideation and are personally invested in the test success. Please post your comment below and don’t forget to get your free complete CrawlMonster SEO Audit. To get started click here. A-B testing is something I feel not enough people do, and should really start doing. What’s the point of having a website ranking if it’s not bringing in as much money as it could be? Great beginners guide. I’ll have to share it with friends the next time they ask me to explain the process to them.